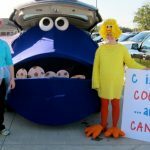 Share the Love #5: I love you a bushel and a peck - C.R.A.F.T. With less than a month to heart day, it’s time to really start thinking about what clever, cheesy saying you’re gonna use! The Share the Love series is all about sharing free printable Valentines for everyone! We’re making this simple, y’all! Here are the 100+ clever Valentine sayings that started my obsession! 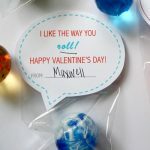 Oh and here are 60+ non candy Valentines saying ideas! 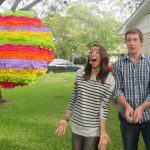 Today, we’ve got one of my real life Austin blog friend… Beth! And she has a super cute printable perfect for the husband and kiddos! Hey C.R.A.F.T. readers! I’m Beth from Free Stylin’. My friend Jamie is just about the cutest, right? I love her Share the Love series, and I’m happy to be back again this year sharing a SWEET treat for Valentine’s Day. My grandpa used to sing the “Bushel and a Peck” song to me when I was little, and I absolutely loved it! Now I sing it to my cute boys. 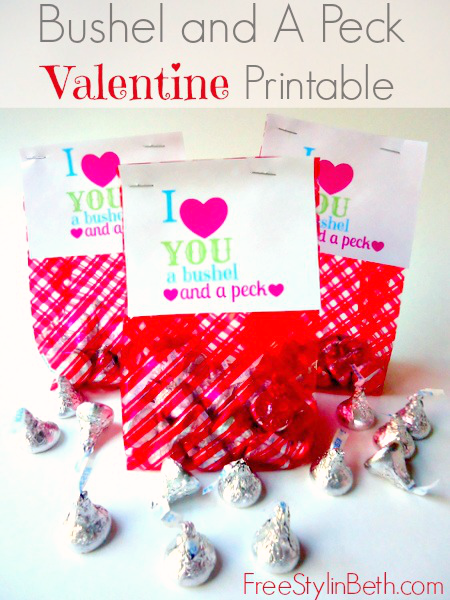 I thought it would be fun to make a Valentine treat using Hershey Kisses for our pecks. Once you’ve printed out the printable, just cut to size. Fill your bags with the kisses, staple shut, and you’re done! 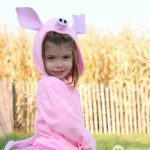 Easy, sweet, and cute! If you’re looking for a non-candy treat, check out my Share the Love idea from last year using heart shaped crayons… Happy Valentine’s Day for Crayon out loud! Come check out Free Stylin’ sometime…I blog about living a stylish life without the expensive price tag. You can also find me on Facebook, Twitter, Pinterest, and Instagram. Y’all, Jamie is the best! Thanks so much for having me little mama! 🙂 Happy Valentine’s Day! Hi I wondered its possible to get a single download of ” I love you a bushel and a peck” instead of a sheet of them?